New Jacquelynne Steves Block of the Month and a Giveaway! Are you ready for a quick Block of the Month? 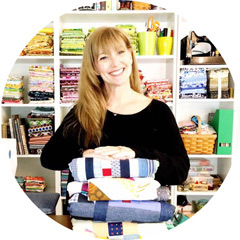 The very talented Jacquelynne Steves is hosting an upcoming free Block of the Month starting in June! You can join the fun by visiting and signing up for Maggie's First Dance on Jacquelynne's blog! I am honored to be one of the bloggers that will be participating in making the monthly blocks with you, sharing my color choices, and maybe give some tips to help make the blocks presented. This is the perfect way to play without the time commitment of a full year! The list of bloggers is so cool, be sure to check them all out and say hello! 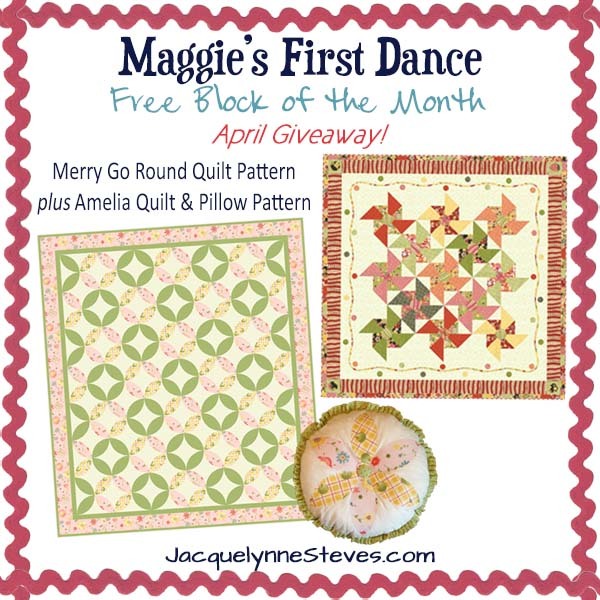 To get this party started, Jacquelynne will be giving away a Merry Go Round quilt pattern and an Amelia quilt and pillow pattern to a wonderful winner. This giveaway will close May 4 and a random winner will be chosen and announced by May 7, 2016. This wonderful giveaway is open to all of our international friends. If you are a no reply blogger, please leave your contact information in your comment. You have a chance of winning by just leaving a comment on my blog! Have you ever been part of an online Block or the Month or sew along? If so, Which one(s)? Hi! No I have never been a part of a quiltalong! But this was such a cute pattern, so I signed up! Participating in The Splendid Sampler and a monthly block with my quilt guild. I am new to quilting and have downloaded one of Jacqueline's BOM patterns but haven't had a chance yet to try making it. I started the Splendid Sampler. So much to learn. Yes, am doing the Splendid Sampler sew along, and really enjoying it, though I am a bit behind. Hope to get caught back up soon. I have never been a contributor for a BOM, but have joined several. The most recent is the Splendid Sampler. I am doing the Gravity BOM. I did Cozy Afternoon altho it is in my UFO pile to finish. I've done two sewalongs with The Quilt Pattern Magazine's Pattern Pastiche. One is complete, one is waiting for border fabric. Well, this will be my first attempt at quilting, so, no, I've never participated in a BOM before! I'm hoping to finish this one on time! I'm doing Craftsy's 2016 BOM. I am doing the Splendid Sampler. Thank you for the giveaway. I came by your site via Jacquelyn's site. I have not taken part of a block of the month on line, but have done a quilt block of the month at our local quilt store. I enjoyed that one and like the pattern offered here..so I am looking forward to doing this one. I am currently doing the 365 Challenge quilt - a block a day for a year! I am sure I can find time to do a block a month! I follow along visually with a few BOM's but haven't made one yet - slogging through my UFO's at the moment. Jacquelynne's looks achievable for someone like me. I participate in the Block Lotto (blocklotto.com) each month. I am doing the crossroads block of the main nth from fat quarter shop and a mystery block of the month from fig tree. I keep signing up for Block of the Month quilts -- from Crafty to Pat Sloan, etc., and get started but have never, ever finished one. I sure have a lot of patterns printed, saved to storage devices, keep buying fabric, but...no good finishes. I did a block exchange with an online homeschool group once. I still haven't put them together though. I participated in Bonnie Hunter's Grand Illusion. I'm a block of the month addict and have done at least one a year for the last 6 or 7 years. I did Jacqueline Steve's one last year too. I am currently in a BOM for a civil war quilt. I can't wait until the design comes out each month. I have done one sew along with Lori Holt. Thanks for the great giveaway. I've done many BOM and two online swaps. We swapped mug rugs and quilt runners. It was fun and I got to meet new quilt friends. I can't wait to start this one. I have never participated in a BOM. Looking forward to it. I have! I completed Pat Sloan's Mystery BOM,"Vacation Time ". I am also part of the Farmer's Wife 1930 Sampler with Gnome Angel. I really like them. What lovely quilt patterns! I have not tried a quilt along yet. I have just started the Frida's Flowers CAL. I participated in a block of the month about ten years ago! It was for a sweet Christmas quilt which I still have and love! Good Morning I love the design and yes I belonged to a Quilts of Valor BOM and I really enjoyed the interaction and seeing all the different fabrics used...it was lots of fun. This one looks to be lots of fun also can't wait..
Oh my gosh I have been a part of sooo many and have completed dozens of quilts in a BOM or a Mystery BOM...love them every month a new pattern. To name a few birdie Stitches, I did the summer sampler series and the simple things just to say a few. Oh and the p2 modern Solids Quilt along oh and the Bloggers block a palozza loved that one. okay I am gonna stop now!!! I am participating in the Splendid Sampler Group now, and I started Cozy Afternoon, but never finished. I am a very new quilter! Thanks for the giveaway! Currently participating in Pat Sloan's Splendid Sampler and what a quilting ride! Love the patterns and learning new techniques! I love BOM's. I did her last two Sew Sweetness and Cozy Afternoon. I loved them both. Also right now I am doing Fandom in Stitches One in A Minion BOM. So fun. I'm currently taking a once/month Baltimore Applique class with Mimi Dietrich and it's tons of fun. No, I've never done an online Block of the Month. Sadly, I follow them, just don't participate! I plan to actually make this one. I have the fabric. I can do this. Really I can! I have stated pat sloans splendid sampler and secret garden. These are the first. Excited to do maggies first dance. I have not yet taken part in a BOM group, but enjoy seeing what others do with them. One day I hope to jump in and do it! I participated in Jacquelynne's Cozy Afternoon QAL/BOM and I'm following The Splendid Sampler right now. No, I have never been part of any online quilting group. It sounds like fun though. Hi, no I have never participated in a Block of the Month nor a sew along. I've done a BOM but it took me 2 years to do it! So it wasn't an "along." I have done several online BOM's the last two being Jacquelynne's Cozy Afternoon and Sew Sweet Simplicity. 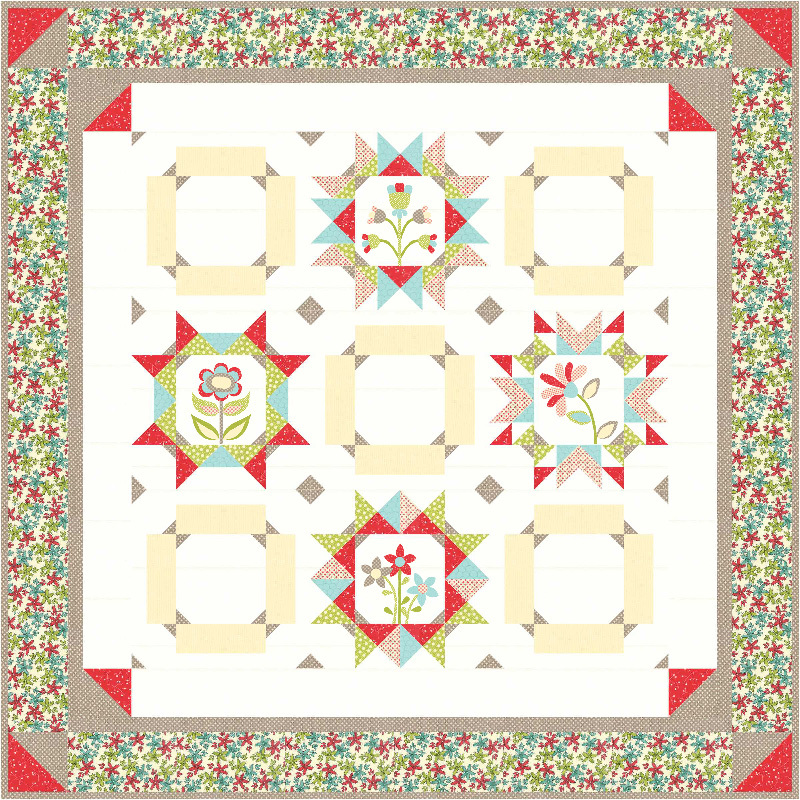 I'm doing my first online quilt along The Splendid Sampler with Pat Sloan. I'm enjoying the fb group much with everyone sharing their blocks and questions. So much fun! I have not participated previously in a block of the month program. I am recently retired again, (Yep! the first time only lasted 3 months before I freaked out and went back to work.) and I am looking forward to this experience. What appeals is that it is free (which fits right in with my retirement fund) and it is short term. This will give me an opportunity to get my feet wet per say and I will get to meet so many new designers/bloggers along the way. I am looking forward to the social aspects of this program. I have done several sew alongs and blocks of the month. I participated in Jacquelynne's Sew Sweet Simplicity BOM and have done the "Sugar Block Club'and a Scrappy Quilt stitch along. I've been part of several block of the month and sew alongs, but one of the most recent ones that I really enjoyed was the Ugly Christmas Sweater block of the month. So much fun!! I'm still working on the Farm Girl Vintage QAL by Lori Holt of Bee In My Bonnet, the Farmer's Wife 1930's QAL with Angie of Gnome Angel and starting the Crossroads QAL with the Fat Quarter Shop. In the hopper are the Moda Shuffle Sampler and Pat Sloan's Mystery Garden BOM! I've done a Leah Day BOM but never a quilt along. Looking forward to anew adventure. I do a lot of online bom and quilatalongs!!!!!!!!!!! I have done a couple of quiltalongs and got the tops done. I just need to get them quilted. Yes. I participate in a wool applique group online. I have followed many the only one I did the blocks was Amy Gibson's BOM on Craftsy. It is finished and was I first quilt.I have a wall hanging to quilt and will not start another quilt until it is finished. I've followed two (I think) of Jacquelynne's M's but neither are finished. Someday... I'm also a member of the 365 Challenge. I've followed along with Jacquelyn's other two BOM's. I've also followed a couple of other BOMs online. I love these patterns. I'm gearing up for a summer of sewing (it's too hot in Texas summer to do much else). I'd love to win these. Currently I am in a JenKingwell Blog Group, and I have participated in Lori Holts Blog Quilt Alongs to make her Quilty Fun and FarmGirl quilts. I am so excited to participate in Maggies Dance BOM. Come on over to my blog for a visit! I will be posting lots of photos!! I am currently following several Block of the Months.. Aurifil Designer of the Month, Pat Sloan's "My Secret Garden" as well as her "Splendid Sampler", one hosted by Lynette Jensen on Craftsy called "Garden Charm", and Jinny Beyer's "Cosmos" to name the most exciting. As you can see I love BOM as I learn so much. Oh What cute patterns and new bom! Thanks! I love block of the months and quilt alongs! Maybe to much haha. The only one I actually completed was the Harry Potter project of Doom by Fandom Stitches. I have many in progress! Splendid Sampler, Farmers Wife, Bloom, My Favorit Things :) the list goes on and on! I am currently giving The Bloom sew along a try. I wanted to practice hand applique. I am keeping up too. I did Jacquelynn's last BOM. I am currently in a group with Jacquelynne and Michelle; two with Pat Sloan, and one with Liz Katsuro. Enjoying all of them, but a little behind due to family circumstance, but plan on catching up this month. Love all of them. So much to learn! 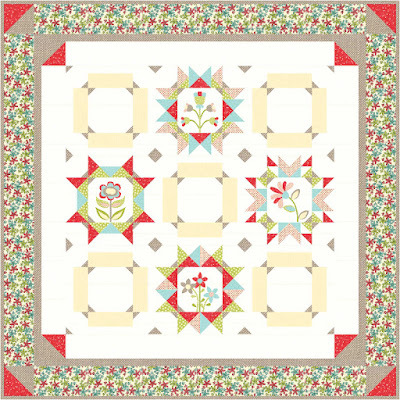 I'm a newbie and am following The Splendid Sampler, loving it! I have been a part of an online BOM but have never finished the tops. LOL I find it fun to hone my skills and to keep trying new patterns. The last ones I participated in were 2016 Aurifil; 2015 Quilt Addicts Anonymous; 2016 my local quilt guild's and of course this one, Maggie's First Dance. I did Jacquelynne Steves last BOM but did not comment or post online my progress. Hoping to do that this time. Right now I am participating in the Splended Sampler quilt along. I have been a part of several BOMs from Craftsy, Oregon Patchworks, Sew Scrappy Sampler, Sew Sisters Quilting Bee, Jacquelyn Steves. I like your blog and the pattern tutorial.